Ankara and Tehran: Conflict or Partnership? Sharing more than harsh words between Ankara and Tehran in December and early January of this year, I raised the question of whether there will not add to the already existing list associated with the Middle East conflict and even confrontation of Iran and Turkey. The relevance of this issue has grown even more after the terrorist attacks in Istanbul on January 12 that the US and NATO are already trying to introduce Erdogan and Davutoglu as an argument for enhanced cooperation between Ankara and the West in Syria. Moreover, this issue has to Tehran and, to some extent, for Moscow, quite practical significance.Another surge of tension in relations with the Saudis makes the Iranian leadership to carefully observe the maneuvers of the Turkish politicians - not whether they are using the developments as a pretext for even tactical, but rather unpleasant Tehran rapprochement with Riyadh. What is more - the desire to extract from Erdogan's confrontation of Iran and the Saudis maximum benefits for the Turkish economy? Or more seriously, and we are talking about a temporary alliance shifts the balance of power in the region? No less relevant immediate prospects for Iranian-Turkish relations and for Moscow, the solution of which the most "punish" Ankara remains unchanged.After all, for Russian politicians is important to have an adequate idea of ​​to what the boundaries of its position on Turkey will be supported in Iran, to avoid the recent disappointments, such as China's position on the Crimea or the reaction of a number of the EurAsEC member states on the issue of response anti-Western sanctions. How it all began at this time? It would be naive to say that the conflict arose out of nowhere. Ankara's position regarding the situation in Syria has always been perceived in Tehran, to put it mildly irritated. And with good reason - the war in the country spread the two countries, whose relations have always been in the corridor between partnership and competition, on opposite sides. Support cost Damascus to Iran in 2014 in irrecoverable expenses in excess of ten billion dollars from the budget - that is, almost 2.4% of nominal GDP. Summing up, thus, the cost of maintaining the Islamic Republic's foreign potential to a dangerous point surge. But the main loss of Tehran in Syria - the people, the elite Revolutionary Guards, selflessly devoted to the ideals of the Islamic Revolution. Moreover, these losses are applied, including those who support Turkey, equips and finances. In such circumstances, to separate politics and economics, what, in fact, for a long time to deal with bilateral relations and Ankara and Tehran, is difficult enough, sooner or later - will burst. Besides Iran over the past year with maximum suspicion I watched flirting Turkish leadership with the Saudis and Qatar. Although through formal, semi-formal and informal channels absolutely the Turkish side tried to convince the Iranians that we are talking exclusively about the decision of economic questions - lending money monarchies need financial infusions of the Turkish economy - much confidence it did not cause. As a result, the voltage has reached such a point that was enough information leaks to the media details of a telephone conversation with Erdogan Rouhani in early December, to save the parties mutual claims spilled into the public space. It is alleged that in a conversation with Rowhani Erdogan demanded to stop the speech of Iranian media and statements of some politicians about the participation of persons close to him in trade igilovskoy oil. Moreover, according to some sources, Erdogan reportedly said Rowhani that the Iranian side is well aware that the oil belongs to the Iraqi Kurdistan, and not worth it, they say, the Iranian president repeated the theses of Russian propaganda. The mentality of the Iranians is that, if you want problems in the relations with this country - talk to him arrogant and please describe a requirement. The response followed immediately, specifically and very unpleasant surprise could. How, in fact, already happened on December 4, when the official representative of the Iranian Ministry of Foreign Affairs Hossein Jaber Ansari called on Turkey to act with more dignity, "to refrain from adventures and take responsibility for the chosen political position." For the media and politicians of Iran this statement will serve as a signal to start the discussion about the true role of Turkey in the region. December 5 advisor to Supreme Leader on foreign policy, Ali Akbar Velayati, a key figure in the relationship between Iran and the outside world, reminded the Turkish leadership that attacks Erdogan "to anything other than to aggravate tension, not lead." He was supported by another "heavyweight", chapter the parliamentary committee on national security and foreign policy Alovuddin Boroujerdi. Who, having rejected as inherent prudence, backhand hlestanul "for the patient" - I advised Mr. Erdogan to "take a country's internal problems, not create new challenges in foreign policy." Yes, and calling at the same time a big mistake as the decision of Ankara to attack the Russian Su-24, and entering a battalion of the Turkish armed forces in Iraq. Naturally, after the presentations, authoritative politicians in Iran, the local press do not deny myself the opportunity to put all that has accumulated - on charges of supporting terrorism to mercenary intrigues in Iraqi Kurdistan. Not forgetting, of course, about the strange movements Erdogan towards Qatar and Saudi Arabia. Turkish President in debt, they say, did not stay. After the events connected with the seizure of the Embassy of the Saudis in Tehran, he directly accused the Iranian authorities that they did not take the necessary steps to protect it, and made it so ambiguous that of subtext, if desired, it can be concluded that as do the Iranian authorities that the seizure and organized. And after made a statement that in general can be interpreted as a break - accused Iran of exacerbating relations with Saudi Arabia, Tehran escalate the situation in the region. What, in general, quite in tune with the angry declarations that sounded January 9 in Riyadh, at an extraordinary meeting of foreign ministers of the Gulf monarchies member GCC. At the unsophisticated observer, and after such a dramatic statements of the Turkish President, and after mutual public battles almost no doubt that the "Grand Turk", first, decided to break with Tehran, and, secondly, to the conflict between Iran and the Saudis finally adopted side Riyadh. After the explosion in Istanbul, there was also a third: Now something really Ankara abandons its "special position" in the Syrian issue and completely agree with the views led Washington international coalition against terrorism, and this is the "international terrorism", and the future of Syria, and the role of the Kurds in all these plans. Moreover, by agreeing with the last paragraph, Ankara will have to recognize the validity of the subsequent award of Kurdish efforts and incurred with the victims, to put it simply - to agree with the emergence of a Kurdish state formation in the Syrian territory. To expedite the process, and Erdogan over Turkey decided to explain the current political situation in more detail. How does it look in practice - below illustrates the proposed selection of the latest quotes. The first is, of course, the inhabitants of the American political Olympus. The United States supports Turkey in the face of acts of terrorism and will continue to support Ankara's fight against terrorism, said Tuesday the National Security Council of the White House, Ned Price in connection with the attack in Istanbul: "We support Turkey, a NATO ally and a solid partner, a valued member of the coalition against the IG the face of attack. We promise to support the continued cooperation and assistance in the fight against terrorism. " By following the chain of command for Europe should be the senior partner. "In the circumstances requiring caution, President Erdogan held a highly ambiguous policy towards the LIH, and only attack in Suruci in late July forced Ankara to join the fight against" Islamic state "in earnest. Terrorist attacks in Istanbul on Tuesday, struck at the heart of economic and cultural capital through the tourists, mostly Germans. Logically, this should force the "Grand Turk" reassess the threats to his country, "wrote the influential French Le Figaro in an editorial comment. - "His hatred of Bashar Assad, perhaps justified, but it can not be based policies. His attack on the Kurds caused by fear of their government ambitions in the region, may have helped him consolidate his power in the November election, but it does not negate the fact that the Kurds are the main bastion of the fight against LIH in Iraq and Syria. "The yield that Western media offer Erdogan is quite clear: "The only way that Erdogan can break out of this trap - it's really to join the fight, which is already conducting its NATO allies, and to give up their illusions and compromising transactions." Well, as without Israel? "In general, Turkey should now change the order of priorities and to understand that the main enemy - Daishev rather than Kurds. We should not forget that Ankara saw in Daishev and a tool against the Kurds that can help thwart the embodiment of the Kurdish dream of an independent Kurdistan - a nightmare for Turkey ", - wrote Israeli Israel Hayom. - "Today everything seems different, and has become the main enemy of the terrorist organization" Islamic State ". Terrorist attacks on the eve of the tourist center of Istanbul, Ankara should make it clear that, paradoxically, yesterday's enemies (the Kurds) become tomorrow's partners in the fight against Daishev. " This kind of political crib is made very professionally. All the emphasis placed in the right places, carrot and stick there - it's up to the next step of Erdogan and Ankara, and all furnished so that this will be a step in one direction only. So what will be the choice? But the reality is not so clear, since spat between Ankara and Tehran, and the position of Erdogan, Davutoglu and the rest of the Turkish elite imbued with nuances. On the one hand, everything looks nice and even decorated with rhinestones. Support for the United States, thanks to Europe, perhaps - a line of credit on concessional terms from the Persian Gulf monarchies. Here are just Erdogan, Davutoglu and the Turkish government as a whole is not the people who offended the external splendor proposals. Since, due to its pragmatic and healthy cynicism, first of all pay attention to their underside. And she strongly breaks through the shine and frankly creeps into his eyes. The financial infusion from the Saudis for the needs of the Turkish economy, you say? And where did they take the money during the collapse in oil prices? They themselves have to cut the budget almost doubled, and the big question is whether they will give as much as is really needed Turkey. Thanks in Europe? What is it like? Overnight solve the issue with the entry of Turkey into the EU? Support for the US? Great, great. But in return, Turkey has to go out to their own hands to create a large-scale threat to its own same national security - to agree to the establishment in Syria of a Kurdish state, but also with the representatives of the Party of Democratic Union (PDS) / People's Protection Units (ONS).Cooperation with them Americans, who see them as shock troops of the coalition against the "Islamic state", Erdogan said more September 24, 2015: "Statement by the United States disappointed me, because we believe MPD / OEF terrorist organization." Moreover, they are considered to be closely related with the Kurdistan Workers' Party (PKK), to carry out attacks in Turkey over the past 20 years. With all the differences between Turkey and Iran over Syria, there is one interesting point. 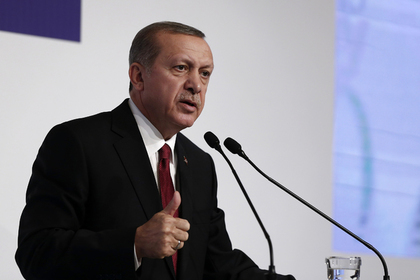 What is today the strategic interests of Ankara? The first is to prevent the formation of a Kurdish state in northern Syria.Second, keep a group of radical Islamists. Third, to promote the formation of a new government in Syria, which is under the control of Turkey. If you remove the third paragraph, or at least make it a subject of dialogue with Iran, the two countries' positions do not look so antagonistic. Anyway - there is a corridor of opportunity where you can arrange according to their own interests. But Turkey's refusal from the first point - for it is a strategic defeat for the future. No options. And if we add to this the potential of Iranian-Turkish economic cooperation, the prospects for trade to 35 billion dollars, 10 billion cubic meters of Iranian gas per year, and many more strokes - the choice of Erdogan and Ankara in favor of confrontation would have looked at least as logical and certainly not pragmatic . Attention is drawn to the fact that in the most dramatic moments of the current spat between Tehran and Ankara, the parties still do not cross certain "red lines", followed by a return to the Partnership becomes impossible. And in Turkey, and Iran are well aware of and mutual necessity and the responsibility for maintaining a working relationship as a guarantee of stability in the region. And there, and there to go for serious conflict, apparently, we do not intend to. The word at the event, as they say "do not climb into his pocket," while retaining the utmost relevance and pragmatism: public rhetoric - is one thing, but the delicate matter of mutually beneficial partnership - is quite another.